Old Trafford, Manchester - Manchester United Blog: Yaya Toure and Michael Carrick out in front. With United's midfield severely affected by injuries this season the responsibility for keeping the reds in the title race has fallen to Michael Carrick. And he has not disappointed; producing some of the best form of his United career just when we needed him most as this table shows. Games = Premier League games where the player started and completed at least 50 mins. 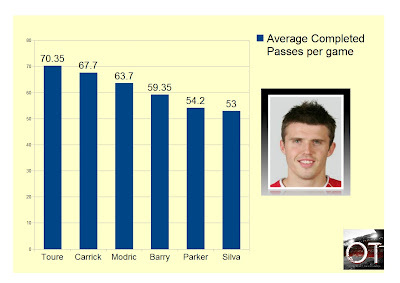 Does not include the two games which Michael Carrick played as a centre back. Only players from the current top three Premier League teams - Man City, Man Utd and Spurs - were analysed.